Uses camera battery, not the standard AA size batteries. Infant Optics is a San Francisco (USA) based firm that specializes in making innovative baby monitor systems for parents with babies and toddlers. Still fairly new in the market, Infant Optics has carved out a solid reputation in the baby monitor system market, thanks to its ability to provide high quality products at a very affordable price. 1) 2.4 inch TFT Screen with Infra-red Night Vision – Fitted with an invisible Infra-red Night Vision feature, the large TFT screen of the DXR-5 allows you to see up to 15 meters in complete darkness! The Night vision feature is automatically turned on as soon as the lights are put out, and the video on the screen adjusts to the light’s level showing you a very clear video of your baby. However, using the night-vision (obviously) diminishes the video quality, but it is still clear enough for you to monitor your baby’s room well enough. 2) 30 fps Video Streaming – At under $100, the video quality on the DXR-5 surpasses that of its competitors in the 2.4 GHz category, and at 30 fps it actually feels like a smooth running live video. None of the other competitors of DXR-5 offer such a high quality of full colour, video streaming at a low price of under $100. 3) Secure FHSS Data Encryption – Using a unique FHSS (Automatic Frequency Hopping System) technology, the DXR-5 is able to transmit the video and audio files in an “encrypted” form within its 2.4 GHz spectrum, from each camera to the monitoring unit. The “encryption” of the feed ensures that no one is able to interfere with the audio/video feed or hack into the baby monitor system unit and it is only you who is able to watch the special video feed. 4) White Noise Eliminator Module – There is a brilliant “White Noise” eliminator module fitted in the DXR-5 which ensures that there is no static interference in the video streaming, due to other wireless devices such as mobile phones, routers or video game controllers in the vicinity. The eliminator module, again, is automatically handled with the audio feed which means that it wont become active if the noise level near the system is below a pre-set level for 10 seconds. However, as soon as some kind of noise is detected near the monitor, the system re-activates the audio feed, along with the White Noise eliminator module, transmitting a noise-free feed. 5) VOX (Voice Activation) Technology – The VOX( Voice Activation Battery Saving) feature is the main reason for the DXR-5’s outstanding battery life. In VOX mode, the baby monitor system saves plenty of battery charge while still being alert. The system is built to automatically turn off the monitor after 3 minutes of quietness and inactivity, thus saving electricity and the battery charge. As soon as the monitor detects even the slightest of murmur or noise, it re-activates by itself. The VOX mode can also be toggled on or off, as per your choice. 6) Highly Portable Monitoring – Since the Infant Optics DXR-5 is made of an extremely light-weight plastic, it is very convenient to carry it around your house. It is small enough to fit in your pocket too! The 900-mAh Li-ion Battery ensures that you get up to 12 hours of baby monitoring on a full recharge, thanks mainly to its power-saving features and so do not have to keep it constantly plugged into the socket for charging. 7) Additional Camera Capacity – The DXR-5 allows you to operate and monitor up to four different cameras simultaneously. However, you do need to switch around the cameras manually while monitoring. There is no automatic swapping around the four different feeds or enough space on the screen to show all of them at once, which can be a bit of a bother to some. 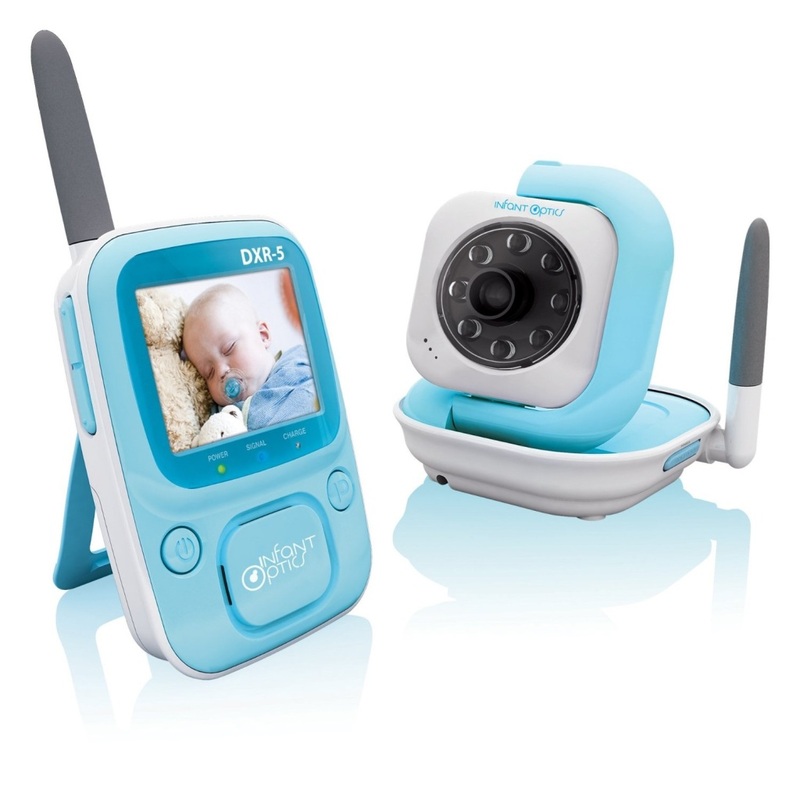 This expandable camera capacity however, eliminates the necessity to purchase different baby monitor systems, and all you have to do is get a separate camera if required (costing around 70$ each). 8) Easy Install – There is no need to install any drivers or software updates for getting the DXR-5 to work. By following 3 simple steps, your monitor system will be good to go. All you have to do is simply plug in the adapter into the camera and the monitor unit, and turn on the power supply! A very handy stand and wall mounting screws are also provided along the package which can be used to mount the camera on the wall, in order to support a wider view of the baby’s room. There is no doubt that the DXR-5 is an excellent product in its category, for all the innovative features and the smart price tag it carries. A testimony to this fact is its ranking as the number one Best-seller in baby monitors category on Amazon. It offers very secure and reliable audio/video transmission and an outstanding battery life, which makes it a very lucrative product in the under $100 category. However, for parents who are looking for a little more versatility (like Pan, Tilt, Zoom features), the DXR-5 can be a bit limiting. Infant Optics has another higher quality model, the DXR-8, which satisfies this criteria as do the more expensive models from different brands DropCam Pro Video Baby Monitor and Withings Smart Baby Monitor. Our confident pick for the under $100 baby monitor system category, remains the Infant Optics DXR-5 though!